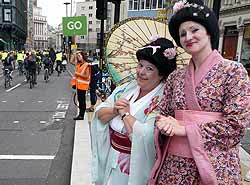 Yesterday's Skyride, according to the event website, saw '85,000 hit the streets of London'. Good job most of them were wearing helmets, then. Clearly the event is a lot more dangerous than I thought. I didn't see any tarmac impacts when I trundled round with the masses though. 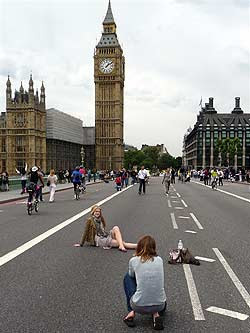 In fact, the road closures between Parliament Square and Tower Bridge were simply enjoyed by everyone - especially on Westminster Bridge. Here, a mini-fad spontaneously evolved for being photographed sprawled out, fashion-shoot-style, on the car-free road surface (right). 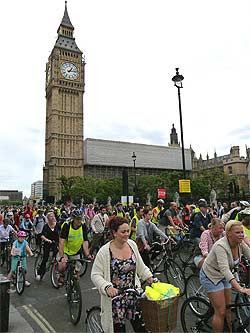 Organised mass rides in uniform, especially ones as occasionally claustrophobic as this, aren't my thing. 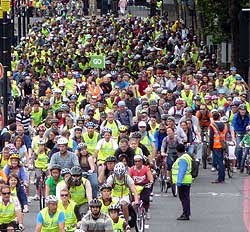 But for those who took part on this cool, cloudy September day, most of them clad in Sky's complimentary tabard and turning the streets yellow, it was definitely a success. It was very crowded, as usual, with families much in evidence. All the parents'n'kids groups I chatted to were delighted with their day out, so fair enough. As well as the usual marquee shanty town offering entertainment in St James's Park, this year offered a 3D cinema experience. 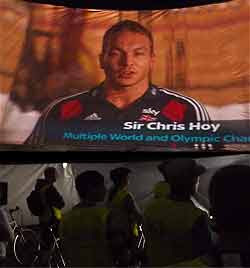 You could wheel your bike inside a dome cinema tent set up on Horseguards Parade and see a five-minute promo film for Team Sky (right) that featured brief 360 degree and 3D sections. The surround-view interludes put you right in the middle of a peloton, with uncompromising close-ups of someone's oscillating bottom. In contrast, the 3D episodes swooped you around lots of gee-whiz perspectives of racing action, interspersed, a little puzzingly, with owls. Most intriguing about the film however was the helicopter shot of Team Sky whizzing along, owl-free, but apparently laying out the blue stripe of a Cycle Superhighway behind them (right). 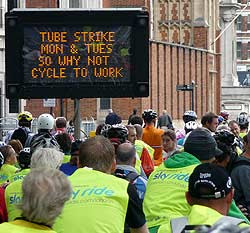 There was a bit of a bottleneck on Lower Thames Street before the underpass, giving the corked droves plenty of time to read the cheery sign: TUBE STRIKE MON & TUES SO WHY NOT CYCLE TO WORK. Great idea, but if it's as crowded as this, it'd take about four hours. At one point we were entertained by roadside members of the West Withering Gilbert and Sullivan Society in costume - something to do with an upcoming programme on G&S on Sky Arts. Clearly it was time to peel off and have some refreshment. Must say this year I noticed even more that the yellow bibs are detracting from this event. Everybody looks the same. I reckon next year fancy dress should be encouraged, or at least individuality. Patience, the lights will change eventually. "I didn't see any tarmac impacts when I trundled round with the masses though." I saw one woman go over her handlebars and have a crunching impact. She braked to avoid a nuclear family who had stopped in the fast lane. I only saw three recumbents, but then they seem to be dying out in London. A few years back I used to see a couple of regulars dicing with death in Waltham Forest but then they vanished. What really annoyed me about Sky Ride was constantly having to stop for road-tax dodging pedestrians who wanted to cross the road. 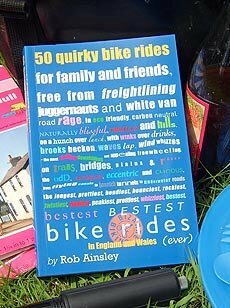 I saw very little in the way of imaginative bikes. 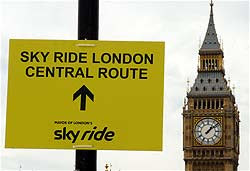 I suspect the artistic cyclists shun Sky Ride because of the Murdoch patronage. 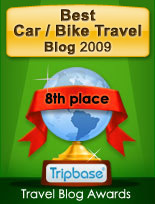 Me, I am always happy to collect another Sky Ride bib, they are very good for dusting and cleaning the toilet bowl. I also picked up several bottles of free purple fluid which I believe may be good for lubricating my chain. If you were wondering where all the penny-farthings were, the Skyride was the same day as the Knutsford Great Race.